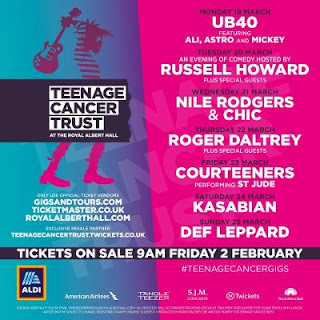 Britain's Teenage Cancer Trust has set the lineup for their annual week-long run of charity shows at Royal Albert Hall. Roger Daltrey, who will once again headline this year, and Who bandmate Pete Townshend, have been deeply involved with the Teenage Cancer Trust over the years and formed Teen Cancer America in 2012 to give back to the U.S. which has given so much to them over the years. This year's run of shows go from Monday, March 19 through Sunday, March 25 and kick off with UB40 Featuring Ali, Astro and Mickey. Veteran artists fill three other nights of the schedule with Nile Rodgers & Chic taking the stage on Wednesday, March 21, Daltrey and special guests on Thursday, March 22 and Def Leppard closing the week on Sunday, March 25. Filling in the rest of the week are comedian Russell Howard and special guests (Tuesday, March 20), the Courteeners Performing St. Jude (Friday, March 23) and Kasabian (Saturday, March 24). Tickets for the shows go on sale this Friday, February 2.